Colorado is opening its first new state park near metro Denver in 35 years Saturday, a protected patch of nature 36 miles southwest of the city. 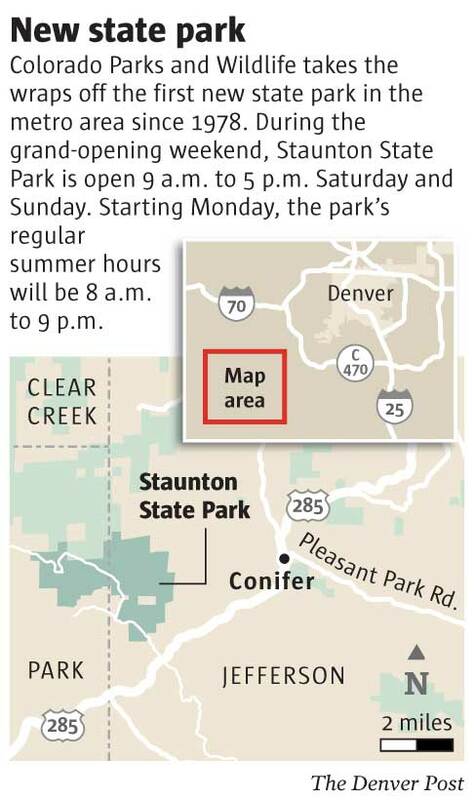 The absence of a commerce-oriented visitor center at Staunton State Park emphasizes the natural assets of the place, such as Elk Creek Falls plummeting 100 feet over granite cliffs and views of the snow-packed north face of Pikes Peak. The 3,828-acre park — a habitat for wild animals from tufted-eared squirrels and yellow-bellied marmots to black bears — also is expected to become a mecca for rock climbers, horseback riders, mountain bikers and hikers. “This is an oasis, a sanctuary, a place where people can get out of the stress and pressure they have in their everyday lives,” Gov. 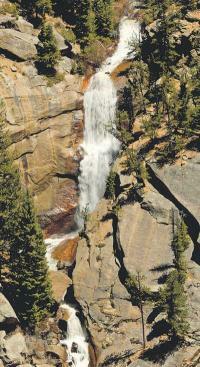 John Hickenlooper said Friday at an official dedication of the park. He used the occasion Friday to sign legislation into law establishing a $9.8 million competitive grant fund for communities statewide to embark on more wildfire prevention by removing dying and dead trees. 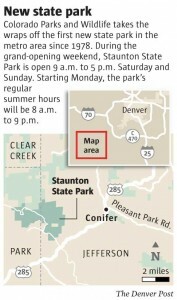 Pine forests are so dense at Staunton that the prospect of people flocking in is raising concerns about wildfires that could threaten Denver’s South Platte River watershed and some 6,500 houses developed within 2 miles of the park. Colorado Parks and Wildlife crews have been racing to thin a third of park forests aggressively in preparation for opening day. Thinning for fire prevention in the park launched a decade ago has cleared 1,200 acres, opening spaces in forests that now include tiny lodgepole pines and a diversity of species including ponderosa, aspen and spruce. Colorado opened Cheyenne Park, south of Colorado Springs, in 2006. The last park created within an hour or so of metro Denver was Eldorado Canyon State Park, which opened in 1978. Budget constraints limit the state’s ability to create parks, but Colorado Parks and Wildlife director Rick Cables said 4,000 acres in the Lone Mesa area of southwest Colorado is under consideration. The state earns revenue on the land from hunting and cattle leases. Frances Staunton, who died in 1989, and descendants of other landowners “wanted to make sure this land was always available for people to enjoy after they were gone,” park manager Jennifer Anderson said. Yet creating the park was difficult. Funding for the purchase of parcels needed to give public access and road issues — state transportation officials had problems with turnoffs from high-speed U.S. 285 — delayed Staunton’s opening for more than a decade. GOCO grants of $10.3 million made the park possible. Colin Chisholm, a lone armed ranger patrolling the park, said his main priority will be enforcing a rule that fires must be kept in designated grills. Since December, he has been living in a cabin inside the park. Admission is $7 per vehicle per day, or $70 for an annual state parks pass. Six seasonal staffers run the park. Beginning Monday, the park will be open 8 a.m. to 9 p.m. daily. No camping is allowed. putting this on my family’s bucket list this summer. can’t wait. I’m excited, too. Will skip the opening festivities and go when it’s much calmer.